The Dow Jones Industrial Average broke a five-day losing streak after a tragedy in northern England halted the ongoing campaign over the United Kingdom's potential departure from the European Union. It was a massive reversal from earlier in the trading session after the Dow shed roughly 150 points in morning trading. While all this volatility was happening, a number of events occurred that you might have missed. The ongoing campaign in the United Kingdom over whether its citizens should depart the European Union was halted today after a British member of Parliament was murdered in northern England. The vote is scheduled for June 23; however, the death of Jo Cox, a supporter of the effort to remain in the EU, is certain to reverberate across the UK. Markets showed signs that the tragedy could fuel additional support to Cox's cause. Here's everything you need to know about the Brexit, the European Union, and the participants in this debate. Meanwhile, the Federal Reserve remains in focus a day after the U.S. central bank elected to not increase interest rates this month. Fed Chair Janet Yellen acknowledged the threat of the Brexit to economic markets and said that she and her colleagues need to see stronger signs of economic growth before lifting rates. The Fed cut its expected growth rate for the U.S. economy to 2% this year and 2.1% next year. If both hold true, President Barack Obama would be the first U.S. leader to not have one year of growth above 3% during his two terms. Oil prices again slipped for the fifth straight session as the dollar rallied on Brexit woes. WTI crude prices cratered 4.1%, while Brent crude prices slipped 3.8%. Oil prices are now at a five-week low as concerns about global demand are compounded by news of a smaller than expected drawdown in U.S. inventories. Money Morning Global Energy Strategist Dr. Kent Moors cautions investors about recent bearish sentiment in the oil sector and says that the recent dip in prices will not last. Here's all you need to know about oil prices right now. But the big stock news took place in the semiconductor sector thanks to a wave of consolidation around the globe. Shares of QLogic Corp. (Nasdaq: QLGC) rallied more than 9% on news that it will be purchased by chipmaker Cavium Inc. (Nasdaq: CAVM) for $1.36 billion (CAVM stock was off 17% on the day). The deal sent shares of CAVM down more than 14%. Meanwhile, shares of ASML Holdings NV (ADR) (Nasdaq: ASML) were off slightly on news that it will purchase Taiwanese chipmaker Hermes Microvision for roughly $3.1 billion. Let's look at the day's biggest stock movers and the best way to protect your money, right now. Apple Inc. (Nasdaq: AAPL) stock was up nearly 0.5% despite news that JPMorgan Chase (NYSE: JPM) had slashed its expectations for Apple Watch shipments by nearly 50%. The firm said that it expects Apple would only reach 7% of its "addressable" customer base, down sharply from the previous estimate of 15%. It was a good day for healthcare and biotech stocks. 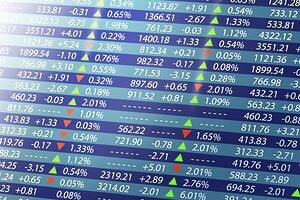 The sector received a nice boost from Merck Inc. (NYSE: MRK), which added 2.5% on the day after the firm reported strong clinical trials for a new cancer treatment. Shares of Envision Healthcare Holdings Inc. (Nasdaq: EVHC) slumped 7% on news of a $15 billion merger with physician services giant Amsurg Corp. (Nasdaq: AMSG). On the earnings front, shares of Rite Aid Corp. (NYSE: RAD) were off 1.2% after the company reported fiscal first-quarter earnings. The firm fell short of Wall Street earnings per share (EPS) expectations of $0.05 by four cents. The pharmaceutical retailer was also short on bottom-line numbers. Shares of Twitter Inc. (NYSE: TWTR) have rallied more than 10% after the company's surprise investment in SoundCloud. Meanwhile, some traders are convinced that Microsoft Corp.'s (Nasdaq: MSFT) $26.2 billion purchase of LinkedIn Corp. (Nasdaq: LNKD) could be a sign that Twitter is next on the M&A block. But investors would be wise to avoid speculating on the future of Twitter and just look at the reality of this flailing firm's numbers. Here's why you need to avoid TWTR stock. Finally, here's what you need to know right now. The Bank of Japan (BOJ) decided to leave its monetary policies unchanged on Thursday, creating yet another trigger for a 2016 stock market crash. But if you want to protect yourself against a massive slump in the global markets, you're going to want to learn about this one simple investment poised to profit as risk rises around the world. Check it out, right here.